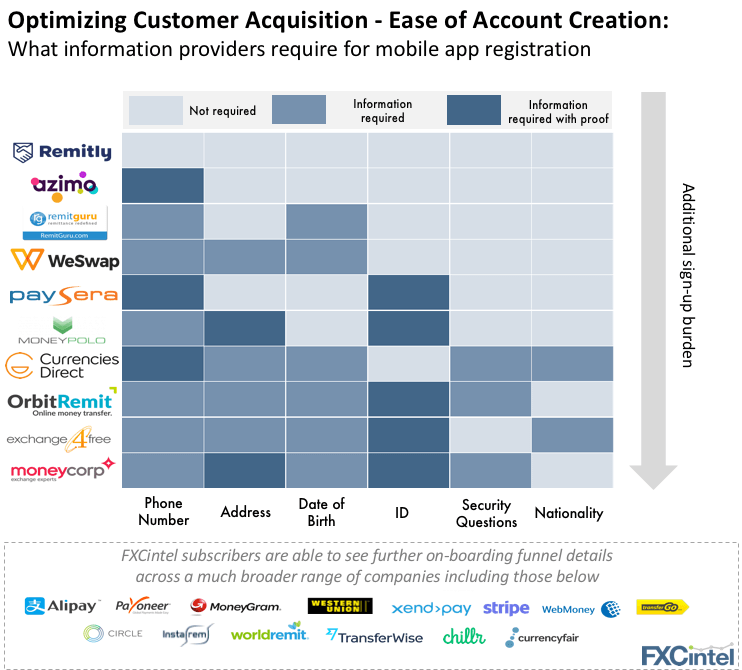 Customer acquisition is one of the key metrics for any company, and in the crowded international payments space, a smooth on-boarding process is crucial. Below we’ve mapped out how easy companies make it for new customers to create initial accounts through their mobile apps. When customers initiate a transaction, payment companies (and banks) are required to collect and verify the customer’s identity as part of the KYC/AML process. As the graphic above shows however, we see a full range of mobile acquisition strategies prior to that. Not all companies wait until the transaction stage to ask for identifying information – some require it upfront as part of the account creation process. Deciding where to place this administrative burden is a key decision for companies as they try to optimize their user experience, and simplify their own operations. The more you ask for early on, the greater the odds potential customers won’t make it through your funnel, or will switch to a competitor. Given how expensive it is to get someone to download your app, failing to convert them to a transacting customer is not the result you want. 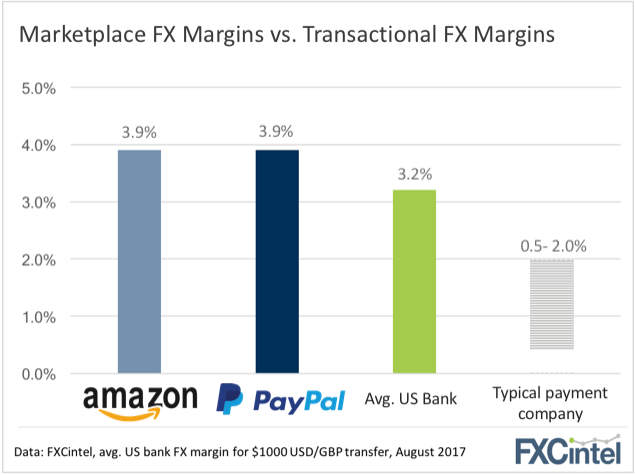 With margins under pressure for so many FX products globally, marketplaces still stand out, as shown by the prices charged by the two biggest incumbents – Amazon and PayPal. This may be due to brand awareness, ease of use, and lack of awareness of alternatives but it also speaks to how far behind this sector is compared to other cross-border products. All this means the marketplace opportunity speaks for itself. A massive global market that is primarily served by high-margin players can only expect more entrants, more products and more change to follow. We’ll continue to track the marketplace segment in great detail – stay tuned. There’s a reason Payoneer recently raised $180m to serve global marketplaces, Vantiv spent $10.4 billion to acquire Worldpay, World First is growing at record rates and OFX, LianLianPay, PingPong, Currencies Direct and others are heavily targeting the ecommerce (or online marketplace) sector. They’re all targeting part of the estimated $2trn in worldwide ecommerce sales, much of which is currently served by international retailers in China and India, as well as Europe and North America. With margins under pressure for so many FX products globally, marketplaces still stand out, as shown by the prices charged by the two biggest incumbents – Amazon and PayPal. This may be due to brand awareness, ease of use, and lack of awareness of alternatives but it also speaks to how far behind this sector is compared to other cross-border products. All this means the marketplace opportunity speaks for itself. A massive global market that is primarily served by high-margin players can only expect more entrants, more products and more change to follow. We’ll continue to track the marketplace segment in great detail – stay tuned. Looking to learn more about how companies approach user acquisition and on-boarding? Get in touch with us.